In 2008, the Trustees of the Nevins Library established a scholarship in Walter Winn’s memory to help a Methuen student continue his or her education in a two- or four-year college, or a trade or professional school. The student who best exemplifies the qualities embodied by Walter “Red” Winn will be chosen by a committee made up of family, Library staff, and Trustees. Special consideration may be given to individuals who have volunteered or worked at the Nevins Library. Walter “Red” Winn was a lifelong resident of the Merrimack Valley who gave many years of service to the City of Methuen through his work, volunteer activities, and selfless devotion to the people of the community. His work at the Nevins Library, the Tenney Gatehouse, the Methuen Memorial Music Hall, Cedars Home, and Phillips Academy brought him into contact with hundreds of people each year, all of whom remember him with great respect and love. He gave many hours of volunteer service to the Methuen Historical Society, the Festival of Trees, the Methuen Historic District Commission, youth sports, and other groups and activities in the community too numerous to list. Red was devoted to family and friends, and exemplified the qualities of integrity, honesty, hard work, loyalty, and kindness. Red passed away suddenly and unexpectedly on March 9, 2008. The award minimum is $250.00. Applications are generally available March-April and the award is announced in the month of June. This website will be updated accordingly and applications will be available here on the Nevins website or at the local high school. Click Here for the Red Winn Memorial Scholarship application. Categories: Community, Remembrance, Town of Methuen | Tags: Methuen, scholarship, service, Walter "Red" Winn | Permalink. This Veterans Day, Sunday November 11, marks the 100th Anniversary of the end of World War I. To honor those Veterans, and all of our country’s Veterans, members of our Methuen Community (and beyond!) have volunteered their time and creativity in making this display of poppies. Please join us as we officially open the Poppy Project Art Installation at the Nevins Library to the public for viewing. Over 2, 000 (!) 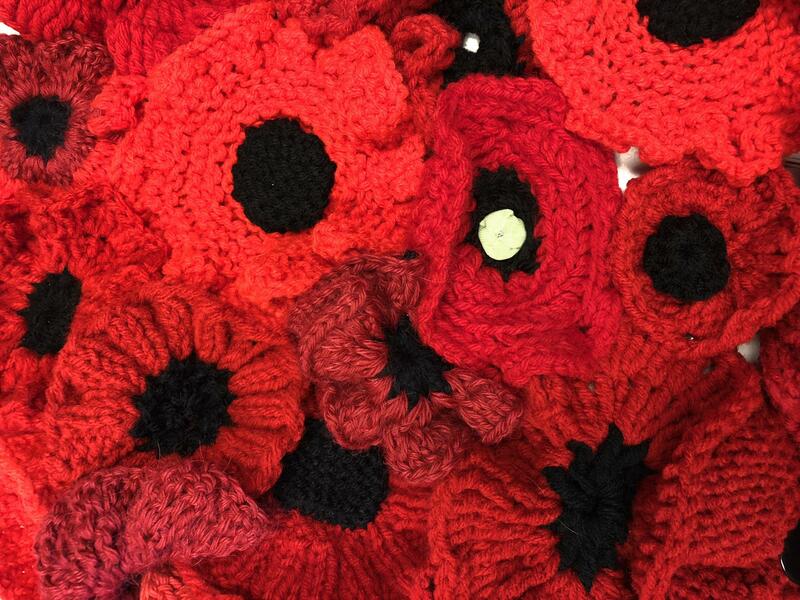 knitted, crocheted, and felt poppies will adorn the WWI Memorial Tree in Methuen, the eagle sculpture in front of the Library, and the library interior. We would like to thank the many, many people and organizations who helped support this project in different ways, including the VFW Post 8349 Auxiliary, the Lawrence Ladies Lodge of the Sons of Italy, the Essex Art Center, and the Methuen Senior Activity Center. Refreshments will be available. The Art Installation will be available for viewing until Thanksgiving. Categories: Celebrations, Library Grounds, local history, Methuen, National Observation, Programs, Remembrance, Town of Methuen | Tags: Armistice, art installation, Methuen, poppies, poppy, Veterans, World War I, WWI | Permalink. Categories: Awesome Reads, Books, Methuen | Tags: awesome books, Awesome Box, Methuen, reading suggestions, recommended books | Permalink. All summer we’ve asked you to help us with the community Poppy Project to commemorate the 100th Anniversary of the First Armistice Day in November, and to remember those lost in World War I. Now we welcome Lawrence City Councilor Marc LaPlante as he talks about some of those veterans from Methuen and the Merrimack Valley who fought in World War I. Categories: local history, Methuen, Programs, Remembrance | Tags: Armistice Day, Marc LaPlante, Merrimack Valley, Methuen, World War I, WWI | Permalink. Join us on Methuen Day to walk through history! This self-guided tour of Methuen’s past includes a map and brochure that will guide you through the heart of downtown, over the Spicket River, up to the Searles Building, and back! Categories: Celebrations, local history, Programs, Town of Methuen | Tags: industrial, local history, Methuen, Searles, self-guided tour, Spicket River | Permalink. 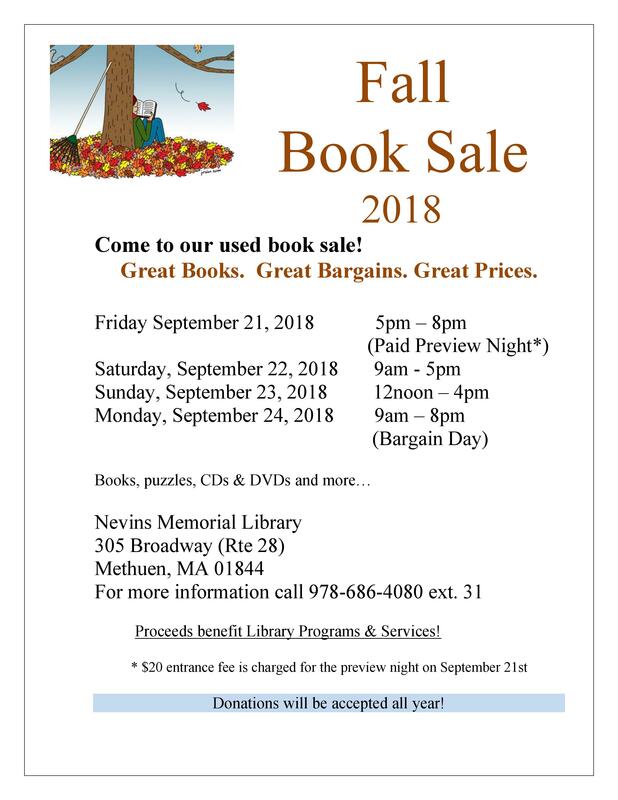 Categories: Book Sale, Books, Friends of the Library, Fundraiser, Library Grounds | Tags: Book Sale, Friends of the Library, Friends of the Nevins Library, Methuen | Permalink. Throughout the Merrimack Valley there are many people who are in great need of what you might take for granted – food, shelter, love, and a package under the Christmas Tree. This year the Nevins Library is sponsoring a few different opportunities for you to give to people in need of help during this season of care and compassion. During December the Library will host two Giving Trees, and continue our regular monthly food drive which supports the Friday Food Backpack program in the Methuen Public Schools. You may donate food throughout the school year by placing your donations in the basket near the front door in the Library’s main lobby. Food items are then distributed on Fridays to children whose families need help on weekends and school vacations when the kids do not have access to school breakfast and lunch programs. 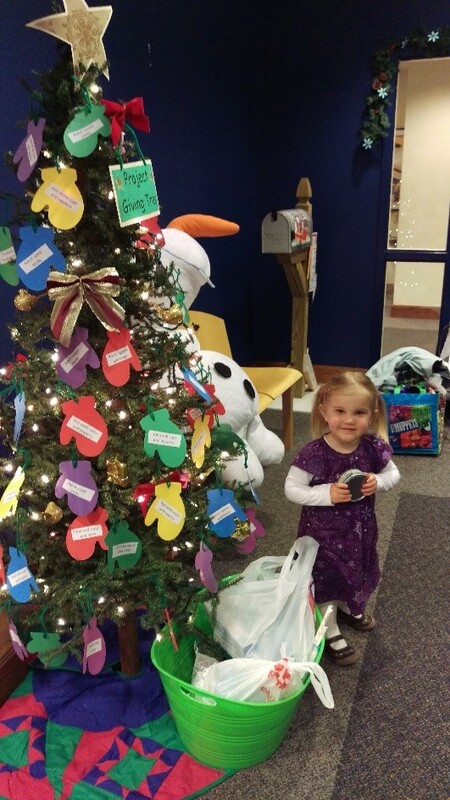 The Children’s Department of the Nevins Library has led the way for many years by hosting a Giving Tree for charity. This year we are helping provide gifts for the children served by Emmaus House in Haverhill. Did you know that the average age of a homeless person in Massachusetts is 8 years old? Through its shelters and housing programs, Emmaus, Inc. served 1,561 children from the Merrimack Valley last year, and on any given night 300 adults and children call Emmaus home. Please help ensure that these children have a happy holiday by donating gifts through the Nevins Library’s Children’s Giving Tree – stop by the Children’s Room and choose a wish list item to purchase and put under the tree by December 15, and we’ll wrap and deliver them to Emmaus! Help bring some holiday joy to the residents of Nevins Nursing and Rehabilitation Center by participating in the Secret Santa/Giving Tree at the Nevins Memorial Library in Methuen. Anonymous tags with gift ideas will hang on the tree on the Library’s main floor. Pick up a tag and purchase the suggested item (no more than $10.00 please.) Please return your unwrapped gift by December 16th in the box located next to the tree. Gifts will be distributed at a party in December with a surprise visit from Santa! This program is coordinated by Connor Aalto, who is a student volunteer at the Nevins Home. Categories: Charitable Project, Library Grounds | Tags: charitable giving, Emmaus House, giving tree, Methuen, Nevins Nursing and Rehabilitation Center, Nevins Nursing Home | Permalink.